The history of Catholicism in Vermont began in July of 1609 with the arrival of Samuel de Champlain, who named the land for its green mountains (“Voilà les monts verts!”). The Church developed slowly through three phases. The early period of evangelization and missionary activity planted the seed and set down roots. Catholicism in Vermont came of age with the establishment of the Diocese of Burlington in 1853. The third, contemporary phase began after about 1965 with efforts to implement the renewal of the Second Vatican Council. The year before Champlain arrived in Vermont, the explorer had engaged the Society of Jesus to evangelize the Native Americans in the new lands, but the Jesuits did not arrive until the year after his death. One of them was St. Isaac Jogues (1607–46) who passed through Vermont on at least four journeys between New York and Quebec in the years before his martyrdom. Among his stops as a captive was the little island on Lake Champlain where he was tortured and where later Jesuit missionaries offered Mass. Before Sieur de La Motte constructed a fort on the island that bears his name, Jesuit Simon Le Moyne crossed through Vermont on a diplomatic journey between Quebec and New York in September of 1654 and Jesuit Pierre Raffeix stopped at the Shrine of St. Anne on the Isle La Motte, in May of 1666. Later Charles Albanel joined Raffeix there in September of that year in hearing confessions and saying Mass. In the summer of 1667, Jesuits Jacques Bruyas, Jacques Frémin, and Jean Pierron ministered to some three hundred soldiers on the island near the feast of St. Anne. Of these, Jacques Frémin (1628–91), famous for converting 10,000 Native Americans, was among the founders of the Isle La Motte. 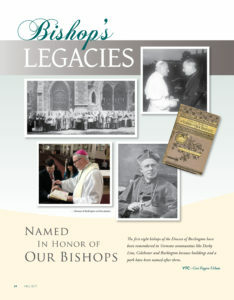 Learn about the legacies of the bishops of the Diocese of Burlington in this Vermont Catholic Magazine article from pages 24-29 of the fall 2017 issue. Click the image to view the full article.